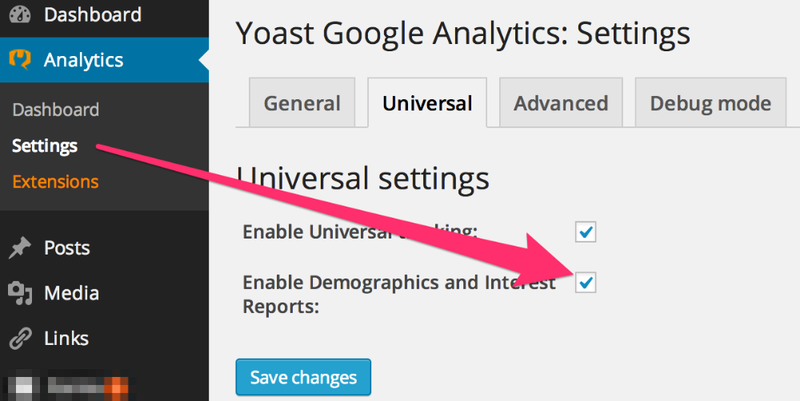 Our Google Analytics plugin now supports Universal Analytics. This means you'll also have the extra benefit of the Demographics and Interest reports. The Demographics and Interest reports are only available if you're using Universal Analytics. If you're still on classic analytics, but you want to use the Demographics and Interest reports, you'll have to switch over to Universal Analytics. Log into your Google Analytics account, select the right property and make sure you're in the Reporting tab. Once there, go to Audience > Demographics > Overview. You're all set! Again, as mentioned, it might take 48 hours for the tracking code to validate. now supports Universal Analytics. This means you'll also have the extra benefit of the Demographics and Interest reports. The Demographics and Interest reports are only available if you're using Universal Analytics. If you're still on classic analytics, but you want to use the Demographics and Interest reports, you'll have to switch over to Universal Analytics.